I have officially completed my promotional tour for Images of America: Rockaway Beach, and am no longer selling the book on this website. The best way to purchase a signed copy is to get it at the gift shop of Jamaica Bay Wildlife Refuge on Cross Bay Blvd. between Broad Channel and Howard Beach. Or, you can order from any online retailer, but I recommend you visit the publisher’s website, arcadiapublishing.com, particularly if you are a history buff. There, you can check out all of their books about American cities, towns and villages, or the history of sports, railroads, and universities. From the history of basketball at the University of Pittsburgh, to the lost train lines of Queens County, Arcadia Publishing’s catalog is long and deep. It’s a veritable trove of great gifts for both men and women. Happy browsing! I am pleased that your book arrived on June 14, in time for Father’s Day. Hope you and Joseph enjoy the stories and photos of Old Rockaway Beach! Thanks for the kind remarks…I wrote the book so the world will know how great Rockaway Beach was, and can be again! I’m looking forward to some great upcoming media coverage in the newspapers serving other parts of Queens. You can probably check that out online, in the Queens Times-Ledger. Thanks for sending in a comment to my blog about Images of America: Rockaway Beach. Glad you are enjoying the memories brought back by the photos. Be sure to look closely at page 94. Arcadia’s format didn’t provide enough space for the full panorama of the original photo, but I cropped it carefully, and you are there on the left corner! I spent my birthday driving around Rockaway seeking out a copy of your book the first week it was published. That was before you listed these locations. I finally found it on Beach 129th Street and it was certainly worth the drive around town! Bought a bagel and thumbed through each page. I have just about everything ever printed about Rockaway’s past, but have never seen dozens of the wonderful photos you found. Your book is a fabulous look a a place we see every day, but my has it changed! Anyone who lives here should certainly have a copy! You are so kind! I am glad that everyone is enjoying my book. Maybe you would like to join us for the Seaside Library Rockaway history book group, which should be held on 6 Mondays in October and November, from 6:30 pm to 7:45 p.m. I’ll forward the schedule once it’s set. Can i please reserve my free copy. I will stop by the Blue Bugalow on Saturday. I have been in Rockaway for 39 years. My wife was born and raised on Beach 126th street. Her Family name is Cashen. We now live in the towers on Beach 105st, and lost 2 cards to Sandy. Our hearts go out to our Rockaway neighbors. I tried to search but the recent hurricanes left me with endless unanswered calls. I am an adoptee from Massena ny, and after finding my family I have tried to help her… I am so interested in what your book may offer her, but more interested in the history in the 1930 31 pageant for rockaway point. I am in Oregon as is my friend, after she was raised in the Bronx area most her life with limited conversation spoke of her family.. if you have any suggestions I would love to hear them. if your book involves any pageant info. please let me know as well. Tina, There are three pageant photos in my book. One from the 1970s, and two of a beauty pageant held in the 1950’s at Playland Amusement Park (that was located in vicinity of Beach 98 Street). I do not have identities for the contestants or judges in the photos. 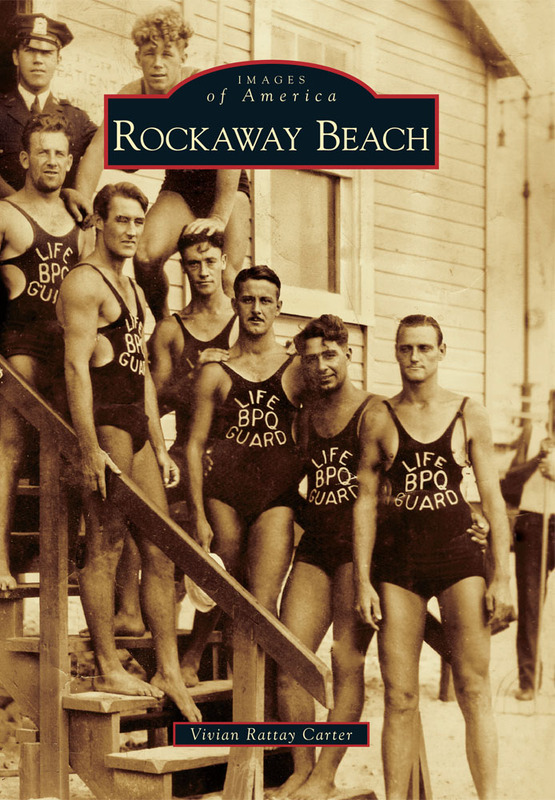 I did not collect information about Rockaway Point, as I was trying to keep the book closely focused on the area defined historically as Rockaway Beach, i.e., from Beach 74th to Beach 108th.